Carrot & beetroot salad, served with maple dressed kale & cucumber & hummus on the side. Kale: Discard the stalks of the kale and tear the leaves. Massage the leaves with your fingers for 30 seconds, to soften slightly. Set aside. Carrot & beetroot: Mix together the carrot, beetroot, atchaar masala (quite spicy, so add as much or as little as you like), salt and pepper and olive oil (2 tsp for 4; 1 tsp for 2). Maple lemon dressing: Mix together the lemon juice, Dijon mustard and maple syrup. Whisk in the olive oil and then mix HALF the dressing through the kale and cucumber. 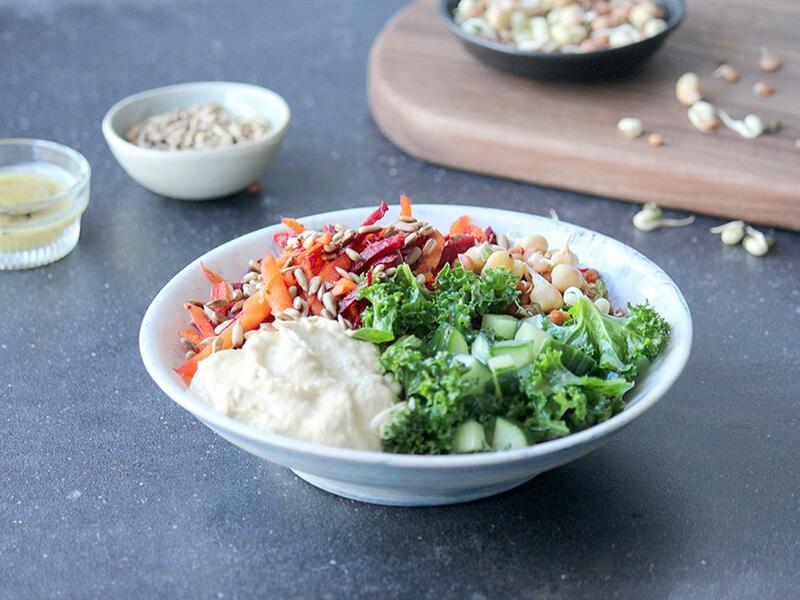 Serve the kale and cucumber with the carrot salad topped with the seeds and mixed sprouts. Serve the hummus and the REST of the maple lemon dressing on the side. "easy and very delicious. too much for one person though ? " "Delicious and fresh and the perfect way to put the overindulgence of the weekend behind you. This salad was light and simple but unexpectedly delicious and even my salad hating hubby didn't hate it. - which is high praise coming from someone who takes the lettuce off his burgers because anything green is just gross. "